A teenager who stole wreaths belonging to Sinn Fein in “revenge” for a suspected attack on a loyalist memorial site has received a four-month suspended jail sentence. Macauley McKinney, 19, was told he could have started a riot over his part in a suspected group raid carried out in west Belfast. McKinney, of Roslyn Street in the city, pleaded guilty to the theft carried out in the early hours of March 7. 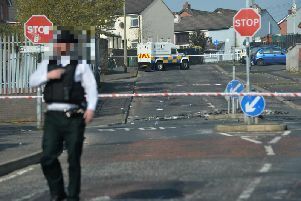 Belfast Magistrates’ Court heard he was arrested after police stopped a car near the scene of the crime on Hugo Street. Two other men and a 17-year-old youth were said to be in the vehicle with him. They are facing the same charge of stealing two wreaths of unknown value belonging to Sinn Fein. Police said parts of a republican-type garland, with green, white and orange ribbons tied to it, were found in the car. An Ulster flag was also recovered from the scene. The wreaths had been provided for a commemoration event at murals on Hugo Street. There is no suggestion that any Sinn Fein representatives had targeted a loyalist memorial site. Defence counsel Mark Farrell accepted his client’s behaviour could have triggered a riot. Mr Farrell told the court McKinney made an “off the cuff” remark to police to explain his actions. “He had gone to the republican commemoration to steal items in revenge for (what happened) at the loyalist commemoration,” the barrister said. Judge McElholm imposed a four-month prison term for the offence, suspended for three years, and a £250 fine.